Whether your needs are artwork reproductions, presentation graphics, or trade show displays, SP&B can get it done. 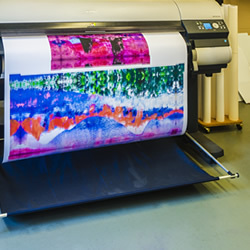 The 12-color ink jet printers produce high quality wide format prints up to 60” inches and resolution up to 1200 DPI. We also offer several media types: Heavyweight premium color paper, backlit film, canvas, art papers, outdoor vinyl and more. Our mounting and laminating services provide your print with the perfect finishing touches. 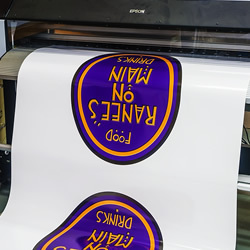 Our two 8-color Epson Eco-Solvent printers are capable of printing up to 64″ wide at 1440 DPI with one of the widest color gamuts in the industry. 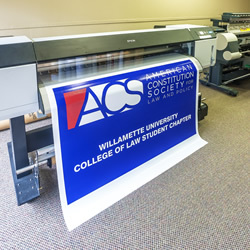 Attract attention to your business with custom signage and posters in a variety of materials in full color: Photo quality wide format posters, vinyl banners, cut vinyl, job site signs and printed advertising. Make a lasting work of art by turning your images into gallery quality displays with full color printing and archival quality canvas material. Create finished wall art by stretching canvas over a wooden frame. Copyright © 2018 Salem Printing & Blueprint, Inc. All rights reserved. Website design by All Pro Webworks, LLC.